All children at Ark Tindal are initially taught to read via the Read Write Inc Phonics programme. The programme is a complete literacy resource for beginner and emergent readers. It is proven to develop fluent and enthusiastic readers who quickly develop an in-depth comprehension of texts. Through the programme children learn to read and write letter-sound correspondences, decode effortlessly and spell and handwrite systematically. The programme also helps our children write confidently using oral rehearsal. 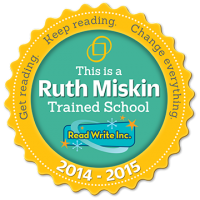 Read Write Inc lessons are exciting and fast paced. Children have responded extremely well to the programme so far and, now in our second year, we are looking forward to continued reading success. At Ark Tindal we are striving to become a reading school where all children and adults read for pleasure and can share in the joy of books. We follow the Oxford Reading Tree scheme which allows all children to access books to take home at a level suitable for them. These books are to be read aloud to family and quietly to ourselves. We encourage all family members to comment on each reading through home reading journals. Our school library is currently being developed to house beautiful new books and a cataloguing system which will allow our children to take ownership of their reading experience. Every class visits our local council run library each half term and we encourage all children to get a library card which allows them free access to thousands of books. At Ark Tindal Academy we believe in preparing our children for the future. In the Early Years and Foundation Stage an emphasis on real life experiences means that children have opportunities to develop their understanding of maths in the world around them. There is a strong emphasis on role-play and the use of concrete materials to support their understanding. Year 1 & 2 are using the principles of Mathematics Mastery in their everyday practice. Mathematics Mastery focuses on identifying characteristics of effective practice in building pupils' secure knowledge, skills and understanding of number so that they demonstrate fluency in calculating, solving problems and reasoning about number. Units are focused around Fairy Tales and Occupations so this enthuses the children and has helped to raise attainment. Year 3, 4, 5 & 6 have adapted their practice to follow the principles of White Rose. We have an emphasis on applying the skills learnt, to set pupils up to succeed when using maths in daily life. At Ark Tindal we really value music. All children take part in our music lessons, celebrations and events. We regularly take part in Ark Music events, including at The Barbican in London and in Birmingham wide events, such as the Services for Education Music Gala. From Nursery to Year 2 the children take part in the Ark singing curriculum with a big focus on using our bodies to make music, rhythm, pitch and enjoyment. In Years 3 & 4 all children learn to play djembe drumming and really focus on playing as a team, rhythm and enjoyment. Years 5 & 6 have weekly violin lessons where they learn essential skills in listening to each other whilst developing their musicality. In addition to this we offer whole class and selected individual violin lessons and there is an academy Choir. Every term we have a musical celebration which parents are most welcome to attend. Throughout the year different after school clubs take place, which have included football, Bollywood Dance and Multi-Sports skills and all children in Years 3 attend swimming lessons for a year and are expected to be able to swim 25 metres unaided by the end of the programme. Each class received 2 sessions of PE per week, one indoor and one outdoor. We are fortunate enough to have a coach from a local secondary school visit us on a weekly basis to work alongside staff to deliver outstanding PE sessions. We work alongside local schools and attend regular inter-school competitions and tournaments. In additon, we offer Ark wide tournaments where we get together with other Ark academies in Birmingham to compete. In each year, pupils build upon their science knowledge in each term with questions drawn from the previous year, in addition to the new knowledge they learn in each new Scheme of Work. Critically the children will get much better at the science methodology as they will have conducted a separate experiment regularly throughout the year with a single focus each term of one aspect of the science method. This process of assessing pupils will provide real transparency to the rational of levels / grades provided that Ofsted and the government will soon require as it is directly index linked to clearly defined investigations and schemes of work. Science in KS1 is being developed with a greater focus on practical investigations and on embedding the skills of scientific enquiry. If you wish to find out any more information about the school curriculum, please ask a class teacher or contact the Academy Office.